Though long-planned and constantly postponed, due to either litigation, or the lack of funding, the first segment of the Beltway started construction in December 2014. Both the pressing of NCDOT by local officials and the, not coincidental, recalculation of the new transportation funding mechanism announced by NCDOT in 2013, caused the Beltway project not only to jump from last place in the state Loop construction list, but to be placed on the Urban Loop Acceleration Plan list. Thus a project that only a couple years ago was projected not to start until the mid 2020's, has received enough funding, made possible by Grant Anticipation Revenue, or GARVEE, bonds, which allow NCDOT to borrow against future federal funding, to at least build the first couple segments, the first from Business 40/US 421 to US 158 was let in October, and awarded in early November 2014 to Dragados USA Inc of NYC for $153,999,950.2 The starting date of the project was December 10, 2014. 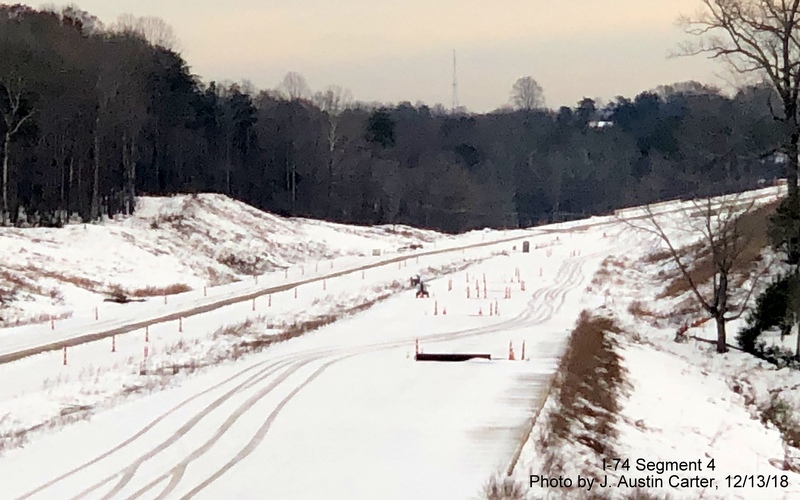 As of March 22, 2019, the project was over 2/3 (71.5%) complete, and ahead of its projected status based on updated costs of the project (68.1%) (the previous cost estimate had the project nearly complete at 98.5%).3 The project now, according to the NCDOT project listings starting in January 2019, is scheduled to be completed by the beginning of May 2020 (delayed a year from previous estimates, and a day later from December 2018's April 30, 2020 date), however, an an NCDOT Press Release from to April 17, 2019 indicates it could open by the end of this year.4 Work started on a second segment from US 158 to US 311 on January 19, 2018. 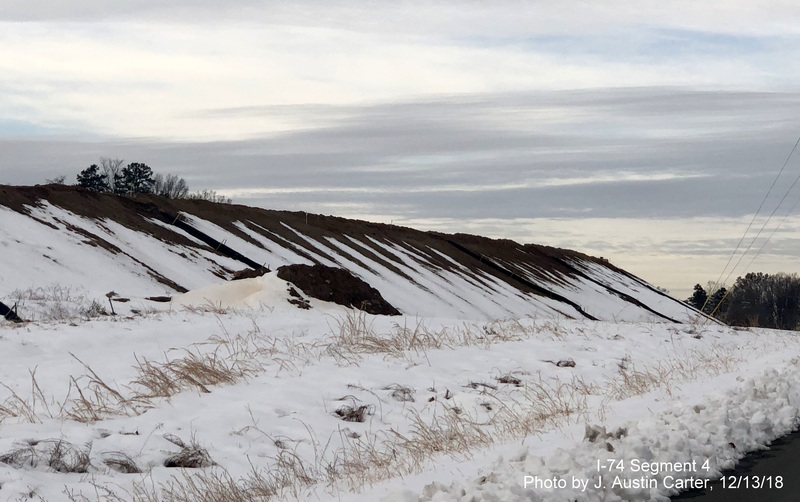 As of February 28, 2019 the work was listed as 34.7% complete. This project is to be officially completed by the early December 2021, but could open to traffic as soon as the end of 2020.4,5 On April 5, 2018, NCDOT announced it had awarded the contract to build segments D, E and F to Flatiron Constructors, Inc. for $120 million, this will take the Beltway from US 311 to US 52. 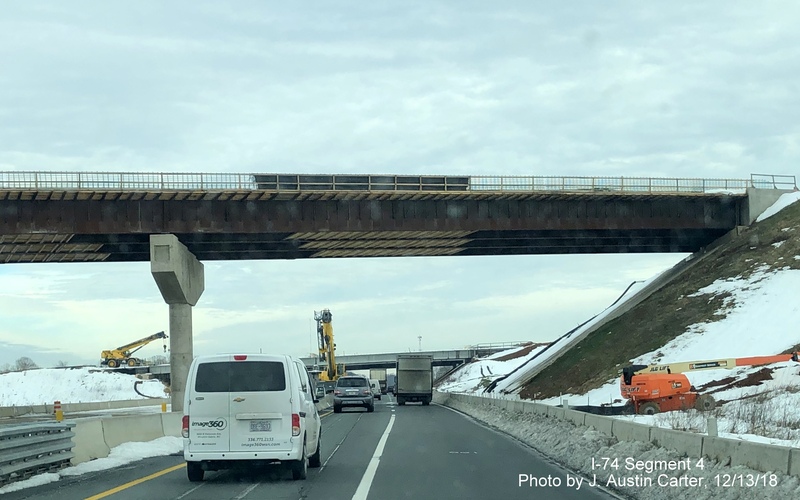 Design work started on April 30, 2018 and, as of March 20, 2019 was 17.0% complete, actual construction started in April 2019 with preliminary tree clearing, work is scheduled to be completed by September 2021.6 The remaining segments to be built, between US 311 and I-40 and I-40 to Business 40/US 421, will be started in 2020 with construction scheduled to be completed in 2023. 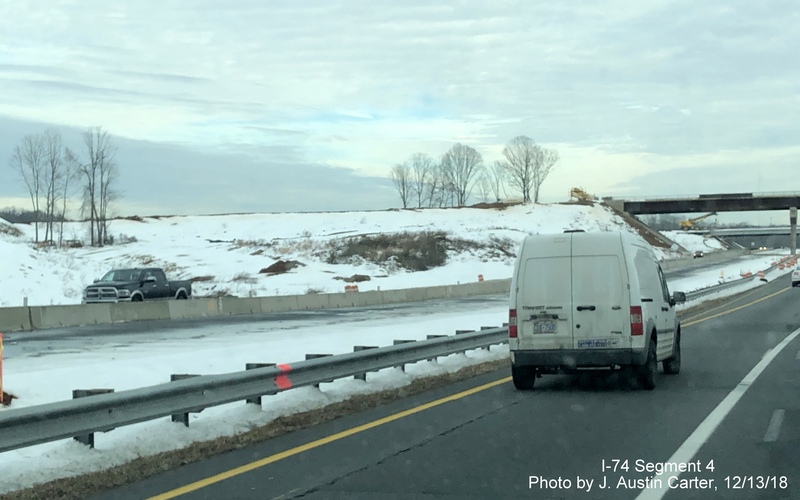 Work on the Beltway interchange with US 52 was awarded in October 2018, work should start in the second half of 2019 and is supposed to be completed in the fall of 2022.4 For a more detailed discussion of these projects, see the Project History section, below. 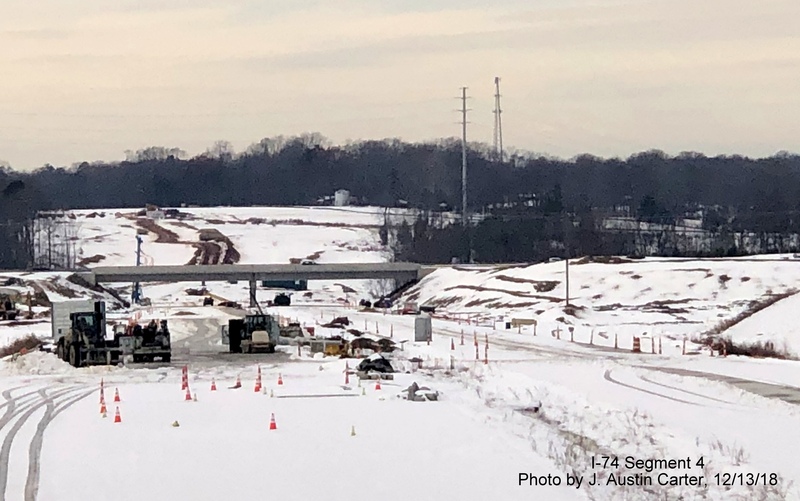 Taken after a December snowstorm, the view from Business 40 East (Future US 421 Salem Parkway) of flyover ramp for I-74/Beltway interchange with bridges to carry I-74 over the highway in the distance. Looking north at roadway under construction to connect to flyover ramp over Business 40 East. Now looking south at ramp under construction to connect flyover bridge to Future I-74 lanes. Closer look at ramp bridge over Business 40 East. Appears to be still significant work to do, one of the reasons the opening has been pushed back to the end of next year instead of April 2019. 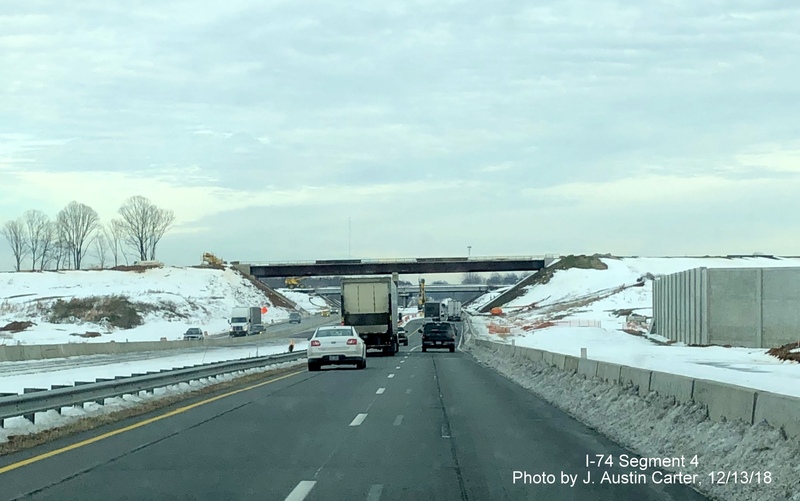 Close view of I-74 bridges over Business 40 East, as with the flyover ramp, there's still a lot of work to do here also to complete the bridges. Looking across the Business 40/US 421 West lanes toward the future I-74/Beltway still under construction. A noise wall is going up along the future ramp to I-74 West. Another look at the interchange construction area from across Business 40. 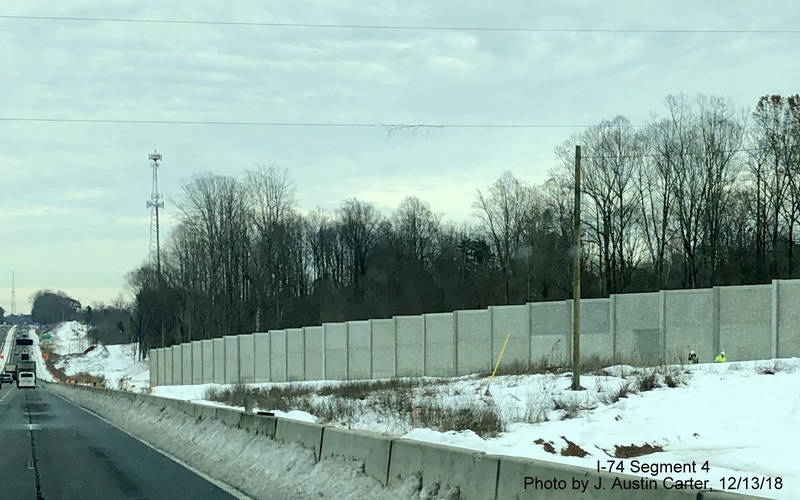 A noise wall is being constructed along the future ramp from I-74 to East Business 40. Moving north to the vicinity of E. Mountain Street, the roadbed for I-74 is being built up to meet the existing bridge. Looking east at the built up roadbed in the vicinity of E. Mountain Street. Looking further east back toward the Business 40/US 421 interchange area. 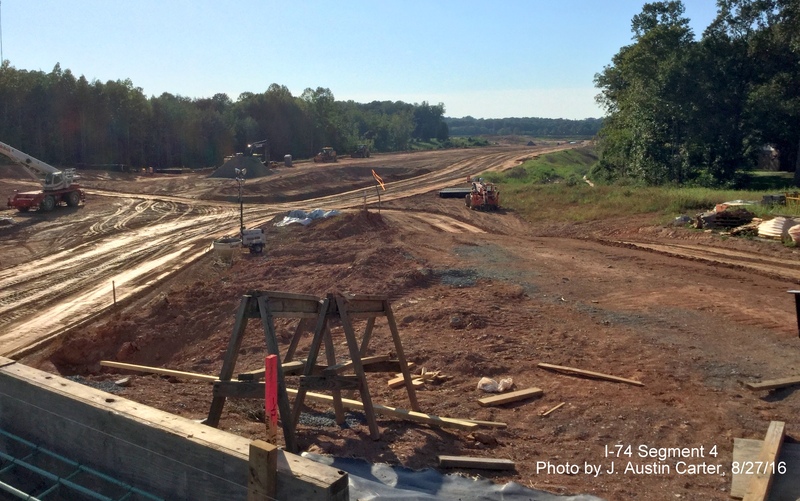 Now further north, looking west from Walkertown-Guthrie Road bridge towards the future US 158 interchange. Now looking east from the same spot back toward Business 40/US 421. Looking back west toward US 158 at another angle showing completed US 158 bridge and work started on the next section to US 311 beyond. Looking at another angle to the east, a noise wall under construction can be seen after the curve in the distance. 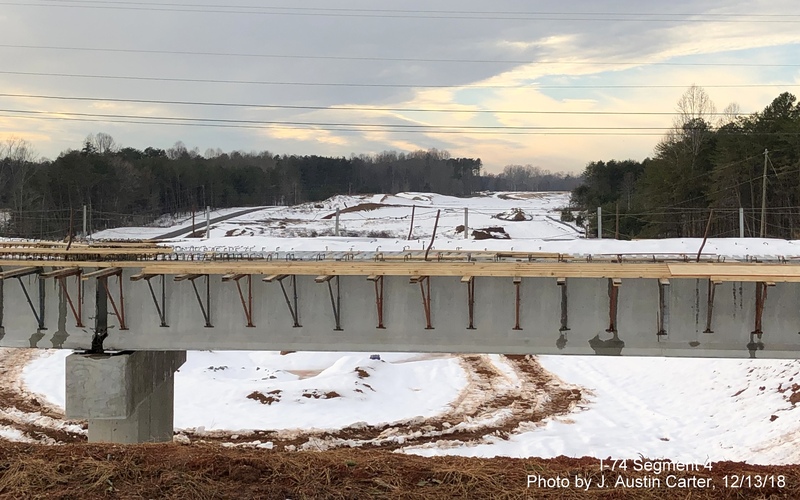 Looking to the east from the completed US 158 bridge back toward Walkertown-Guthrie Road. 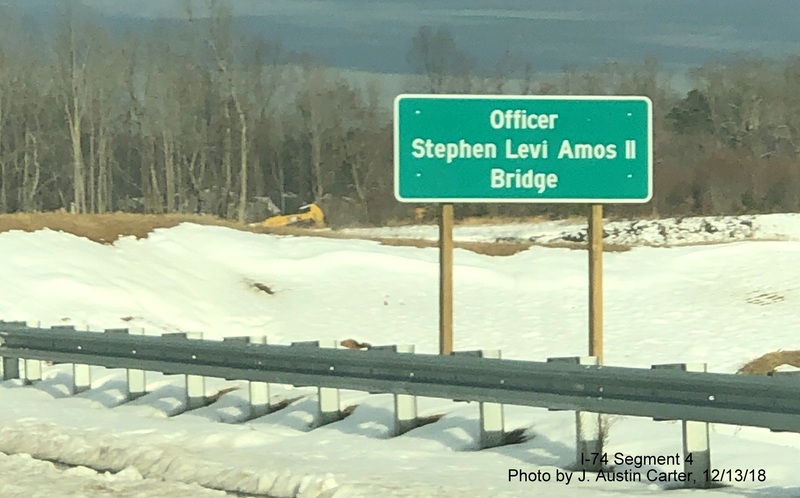 Sign on US 158 bridge heading east indicating dedicated to Officer Stephen Levi Amos II. Looking west from Williston Road near site of future bridge over the Beltway, looking towards US 311. Looking east from current Williston Road over future bridge under construction over I-74/Beltway lanes. Another view west from site of new Williston Road bridge under construction. Road in distance is US 311. Looking east again, over the frame of the future Williston Road bridge to the I-74/Beltway lanes under construction. 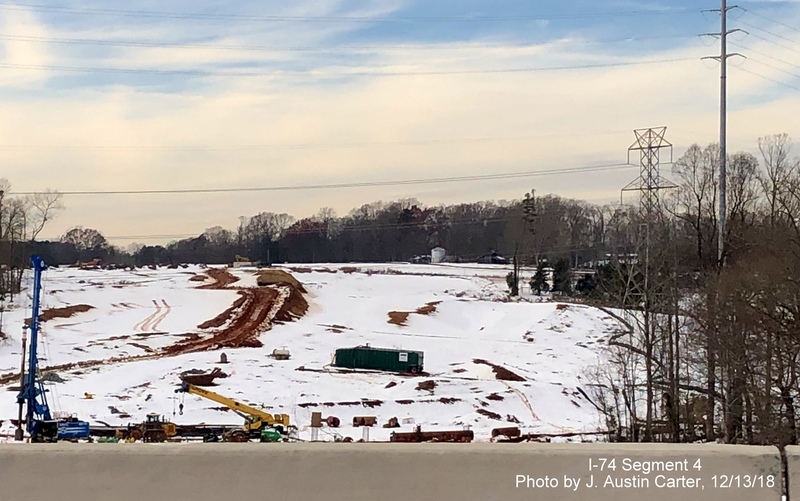 Looking south toward the future interchange with Business 40/US 421 showing little progress in grading the roadway but construction proceeding on a flyover ramp for the Beltway exit. A closer view of the new flyover ramp at the future Business 40/US 421 interchange beyond the US 421 roadway. Looking north or west along the future Beltway alignment toward West Mountain Street showing lack or progress in grading this part of the roadway. View of the Beltway bridge over West Mountain Street, which appears to be mostly complete, except for final grading. View of concrete Beltway roadbed from completed Walkertown Guthrie Road bridge. Looking south or east along the Beltway from the Walkertown Guthrie Road Bridge showing progress in grading along the roadbed completed the year before. Looking north/west toward the future US 158 interchange from Walkertown Guthrie Bridge showing progress in extending the concrete roadbed toward the exit, some landscaping and on US 158 itself the construction of bridges to take the final alignment of the highway over I-74. Looking northwest toward US 158 from completed Walkertown-Guthrie Road bridge over Future I-74. There has been significant progress with placement of the concrete road bed. 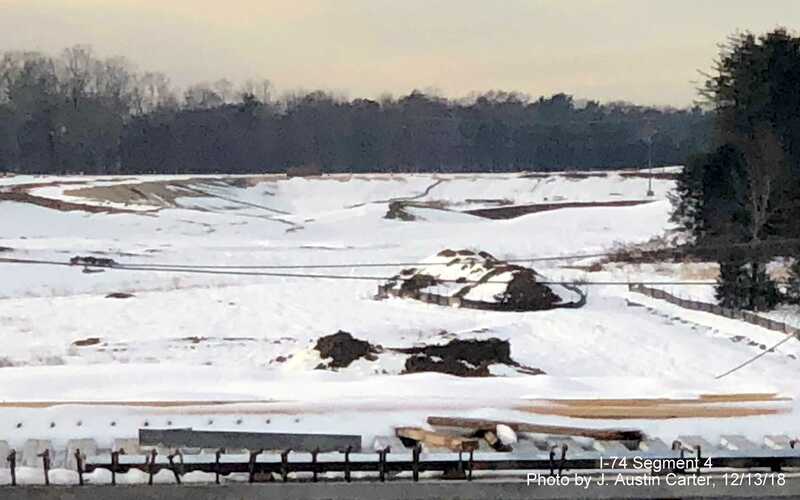 A closer look at the new concrete roadbed for Future I-74 from Walkertown Guthrie Road looking towards the future US 158 interchange. 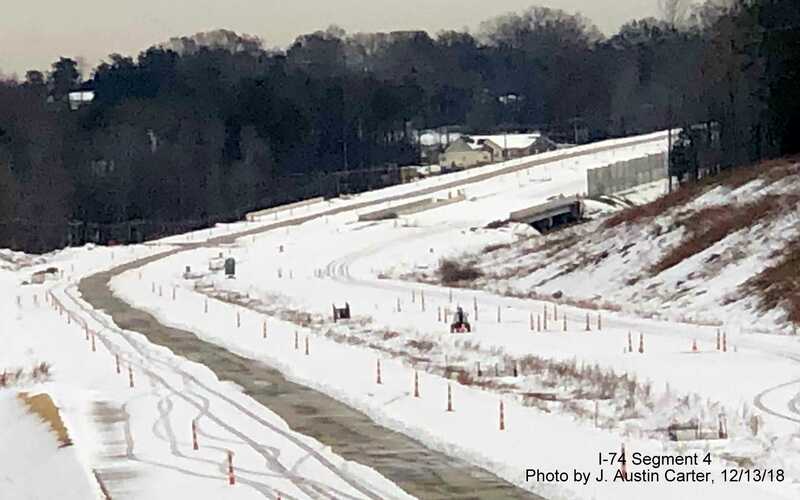 Looking now southeast from the completed Walkertown Guthrie bridge along I-74 roadway headed toward Business 40 showing progress in completing road surface. Traveling south to near Business 40, view looking northwest toward bridge under construction over Mountain View Rd. 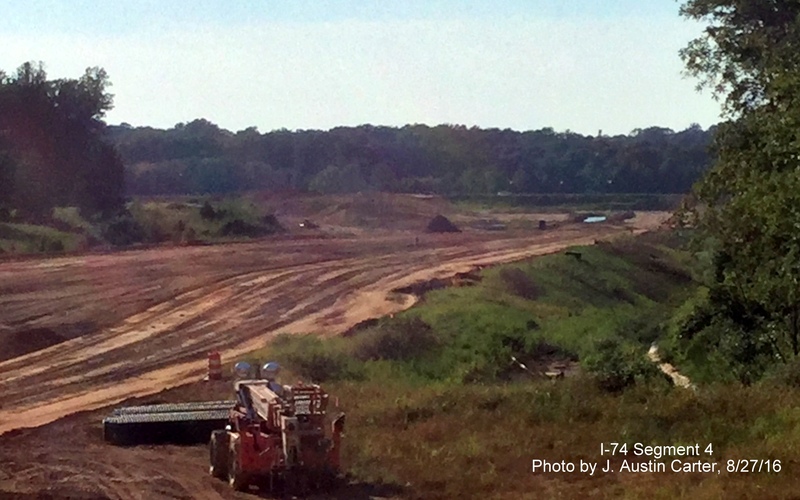 Closer look at progress grading Future I-74 Roadbed heading northwest toward bridge over Mountain View Road. Looking south toward Business 40/US 421 showing grading underway for Future I-74/Beltway interchange. View of paved Future I-74/Beltway lanes just south of US 158. Looking north toward US 158 across the future interchange construction zone, including the temporary concrete plant between the original and current US 158 alignment. View southeast from completed Walkertown Guthrie Bridge over now paved Future I-74 East lanes. 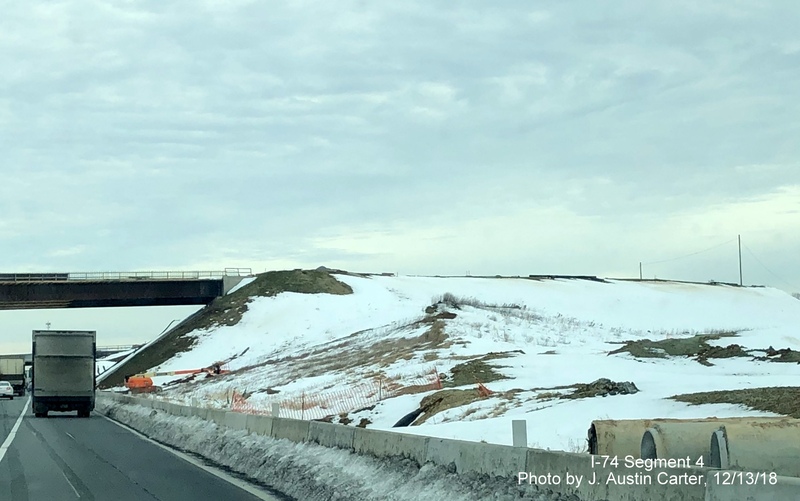 Now looking north along graded Future I-74 lanes toward the nearly completed West Mountain Street and Railroad Bridge (photos of bridge below). 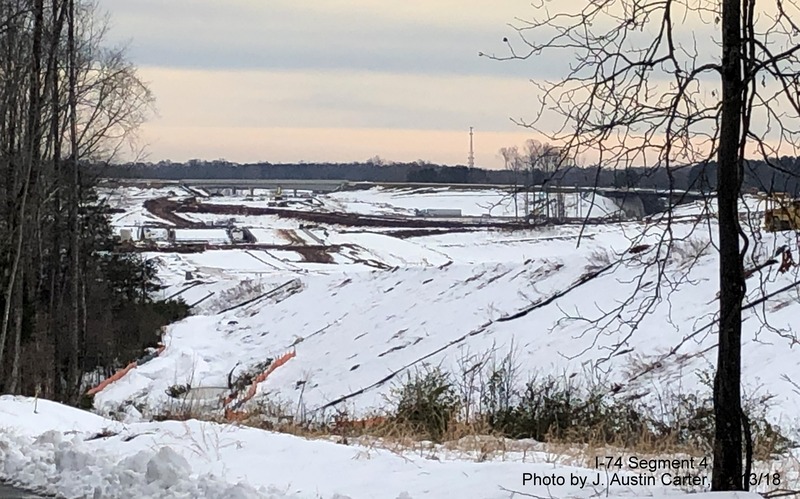 View looking south toward Future I-74/Business 40 (US 421 Salem Parkway) and progress in constructing the interchange (photos from Business 40 below). Looking west Business 40/US 421/NC 150 entering the Winston-Salem Beltway construction zone. 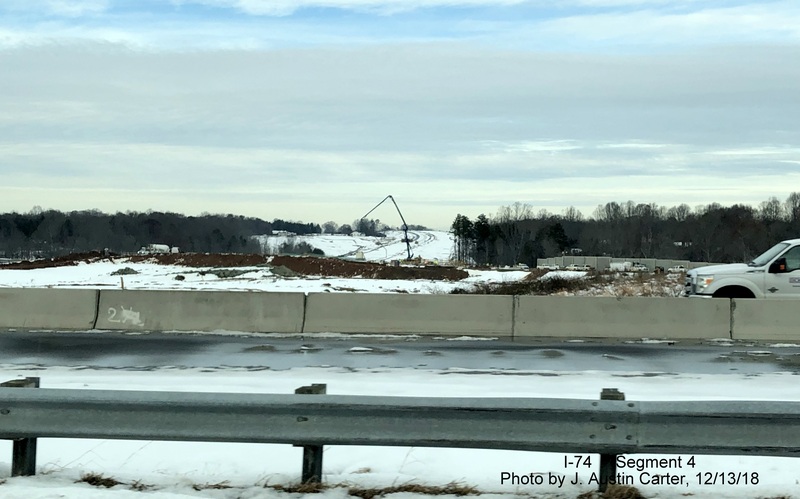 Approaching site of future I-74/Beltway interchange with Business 40 showing clearing and early structure construction. Still continuing west and approaching the grading to support future I-74/Beltway Bridges over Bus. 40/US 421/NC 150. A closer look at construction going on to the south of the Eastbound lanes on Bus. 40/US 421/NC 150. Looking north from Bus. 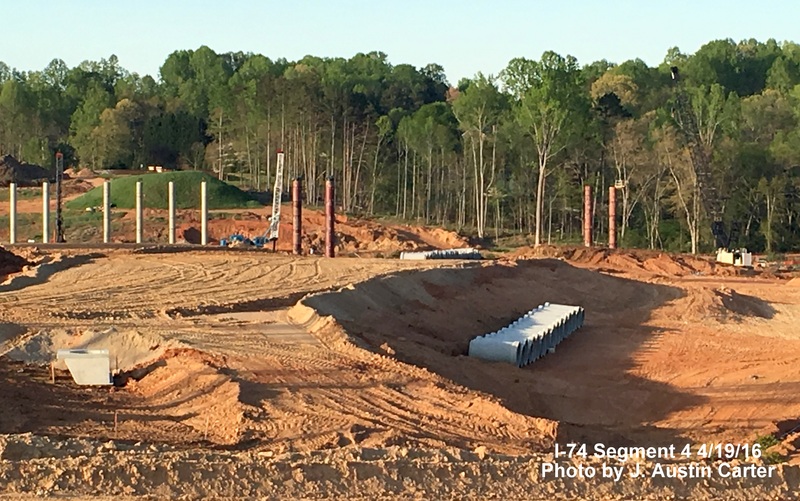 40/US 421/NC 150 along Future I-74/Beltway alignment showing construction of support structures for future bridges. 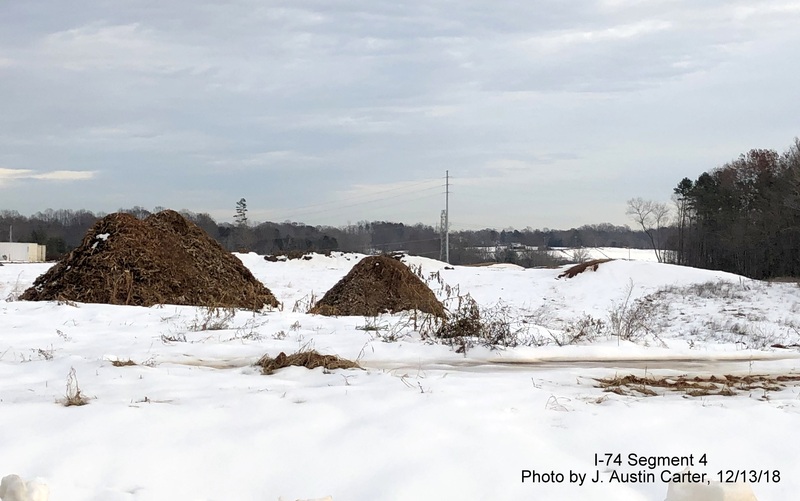 A closer look at the buildup of soil for the future crossing of I-74 West then I-74 East lanes over Business 40/US 421 and NC 150. Heading now east on Bus. 40/US 421/NC 150 approaching the I-74/Beltway construction zone. Looking northwest over Bus. 40/US 421/NC 150 at construction crane at site of future I-74 bridges. Now further north, heading east on West Mountain Street approaching bridges being built to carry I-74/Beltway traffic over the roadway and railroad tracks. Now on the east side of the bridge looking back from church parking lot on the old alignment of West Mountain Street, showing support structures for bridges largely in place. Looking across both old and new alignments of West Mountain Street showing construction to complete grading of the I-74 lanes going on south of the bridges. Looking west down railroad tracks showing bridge crossing both the tracks and the new alignment of West Mountain Street. A closer look at the northern end of the bridge above what was the old alignment of West Mountain Street and showing further fill is needed before lanes can be paved to meet the bridge structure. 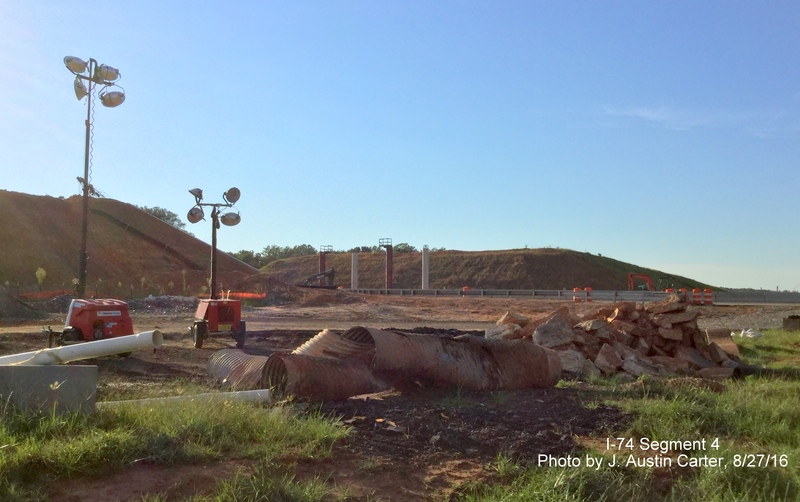 Now at the northern end of the project, looking west along US 158 approaching the interchange construction area. US 158 traffic has been realigned to the south through the work zone. Further west on US 158 in construction area showing work has largely been completed in creating elevated areas for Future I-74 bridges. 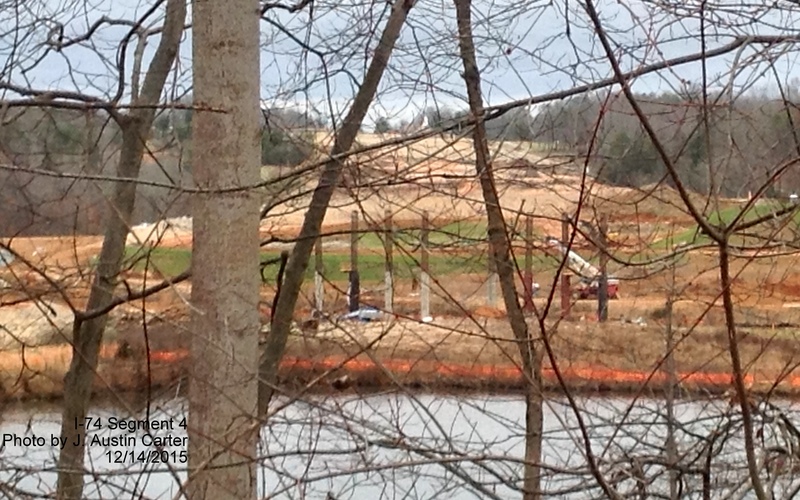 Looking north of US 158 in the construction zone showing future ramp concrete structures covered over by tarps. Now heading back east on US 158 looking down the hill to the Beltway interchange construction area showing how US 158 has been re-routed around the work zone. Looking from south of US 158 at temporary concrete plant built in the future interchange work zone. 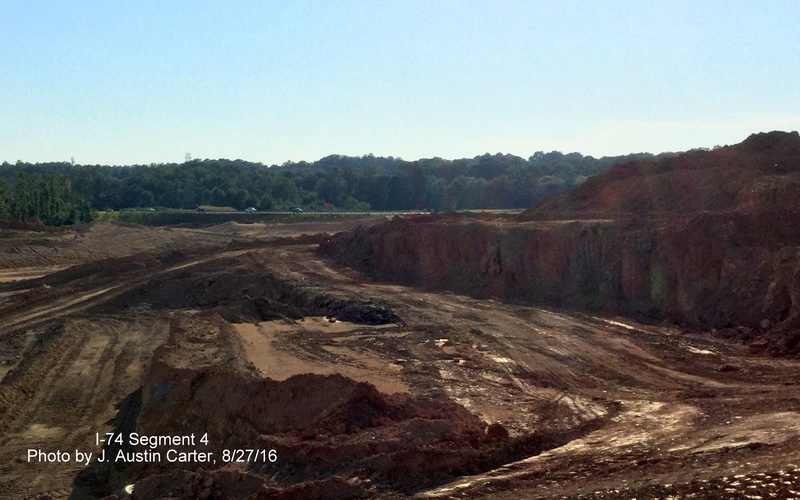 Looking south from US 158 over the alignment of I-74/Winston-Salem Beltway showing grading being completed. 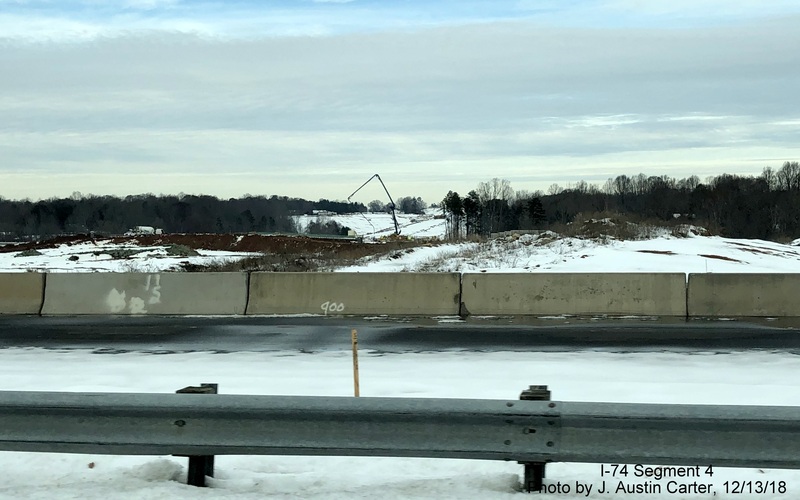 Another view of the temporary concrete plant just east of the future I-74/Beltway lanes being graded south of US 158. One of the many road closed barriers placed along residential streets along the corridor of the Northern Beltway due to the road's construction. 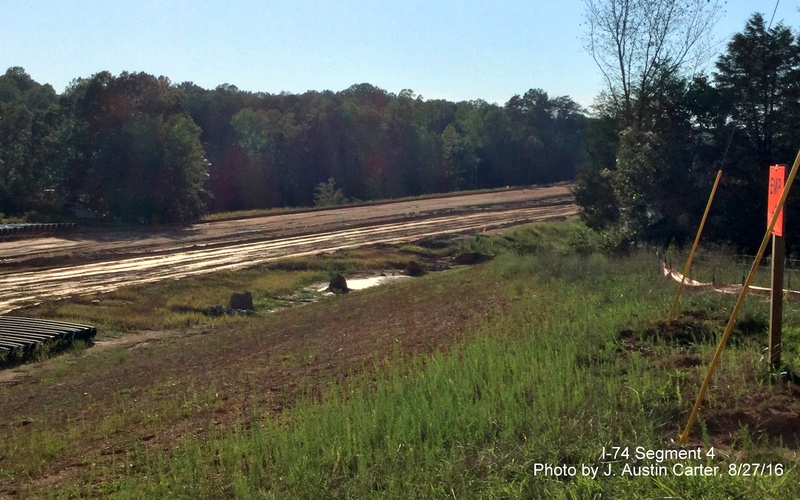 Future Beltway section being graded between Business 40 and US 158. Part of newly constructed part of Beltway showing built-up roadway. From West Mountain Street portion of new bridge being constructed for Beltway near temporary cement plant. 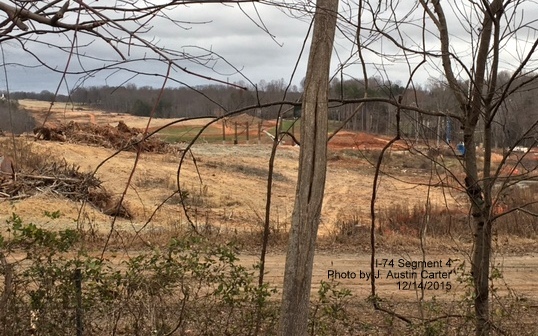 Looking at massive clearing and earth moving being done at site of future interchange between the Beltway and US 158, seen in the distance. Future bridge being constructed along path of Northern Beltway. View from bridge under construction shows the amount of earth moving being done along the I-74/Beltway corridor south of US 158. 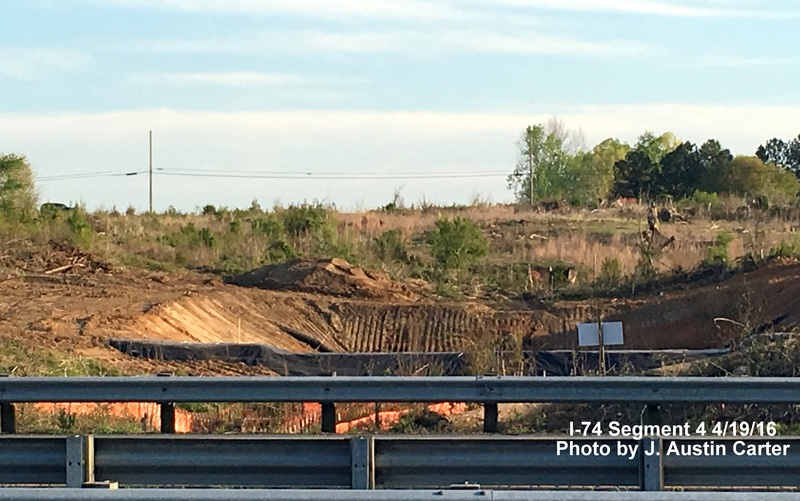 Closer look at same bridge showing deck under construction over future Northern Beltway/I-74 near US 158. 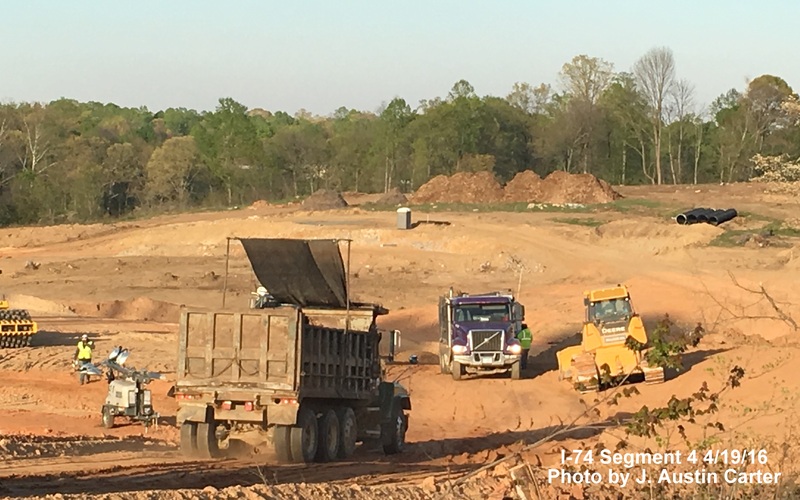 Another scene of grading for future Beltway lanes east of Winston-Salem, here the future eastbound lanes are further along than the west. Beltway construction being threaded between houses, seen in the middle and right. A closer view of construction at the northern end of the project for the future interchange with US 158. 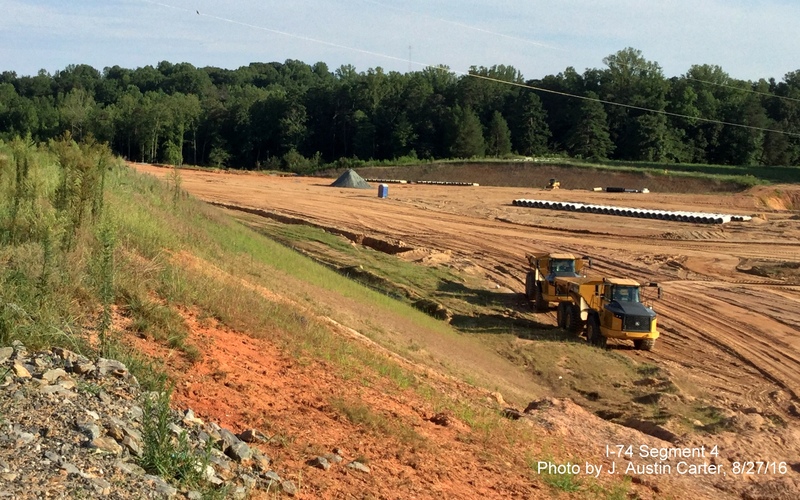 Looking along West Business 40 showing clearing progress for future Beltway interchange. Looking at construction crews working just north of Business 40 on Future Northern Beltway interchange. Looking across Business 40 to view clearing for the interchange going on to the south. Work is seen progressing in building future bridge supports and concrete pipes are ready for placing for site drainage. Looking further north showing cleared corridor for I-74/Northern Beltway's path toward US 158. 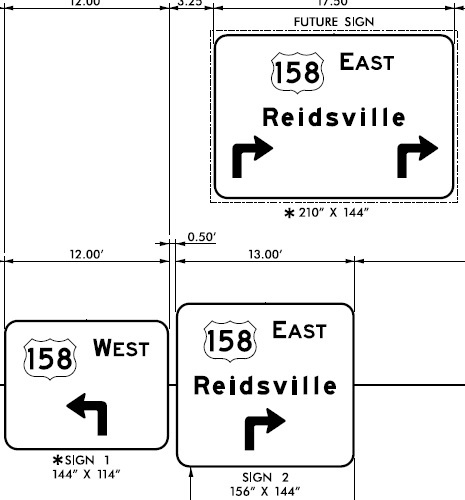 Sign plan for US 311 interchange westbound at US 158 exit (already existing from previous contract, see plans below) showing it will be designated Exit 49. Plan for new arrow-per-lane sign to be placed at US 158 exit when I-74 is completed east to US 311. 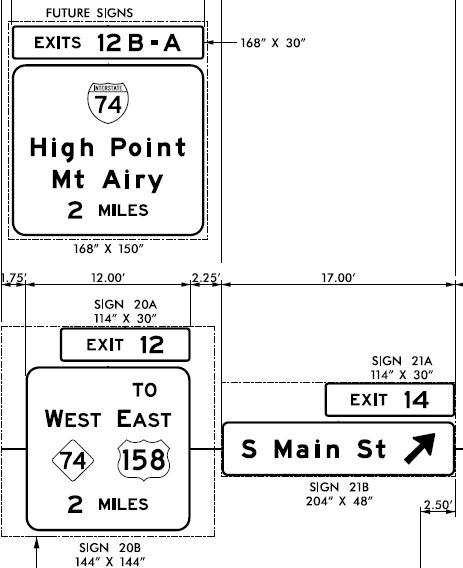 Notice the lack of reference to Business 40 (seen on the earlier plan below) on the US 421 sign. 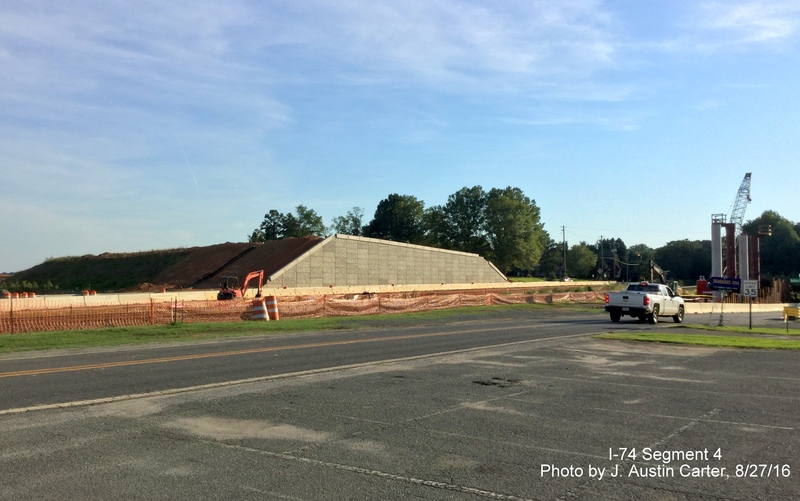 In the spring of 2017, NCDOT announced that the official name for the Business 40 route in the future will be the US 421 Salem Parkway, implying that the Business 40 designation will be dropped. 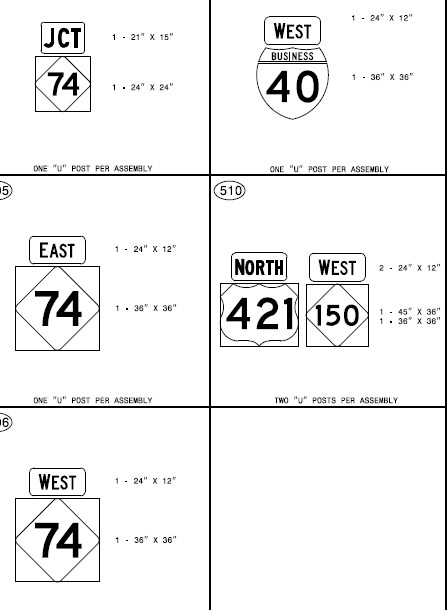 Plan for signage on Business 40 East, showing temporary NC 74 designation, to be changed to I-74 when Loop is, at least, partially completed east to I-40. Initial and future signs for I-74 East at the Business 40/US 421 Exit. 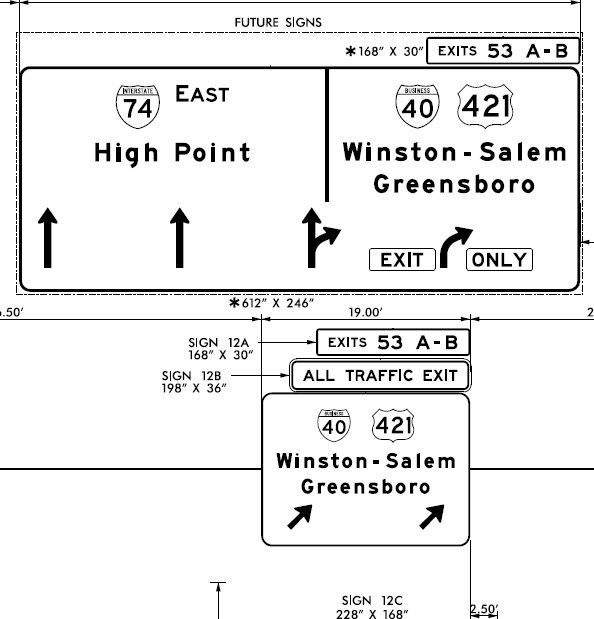 Since these plans were published, NCDOT has announced it will remove the Business 40 designation from what will be called the US 421 Salem Parkway around 2020. Signage plans for the US 158 exit ramp signage to I-74 East. Signage planned for I-74 West at the Business 40 interchange. 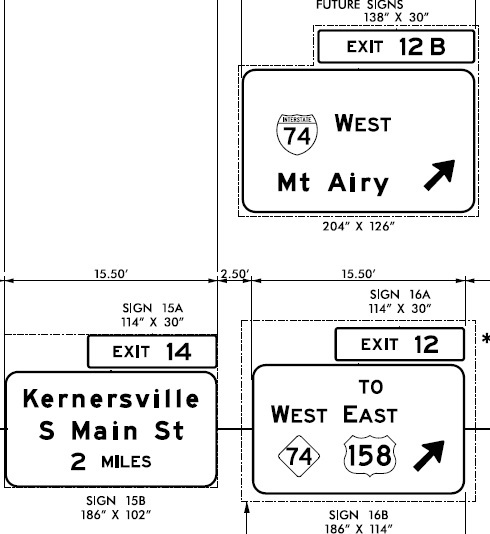 Plans for signage approaching I-74 along Business 40 West/US 421 North at South Main St in Kernersville. Route shields to be featured on this segment of the Beltway. 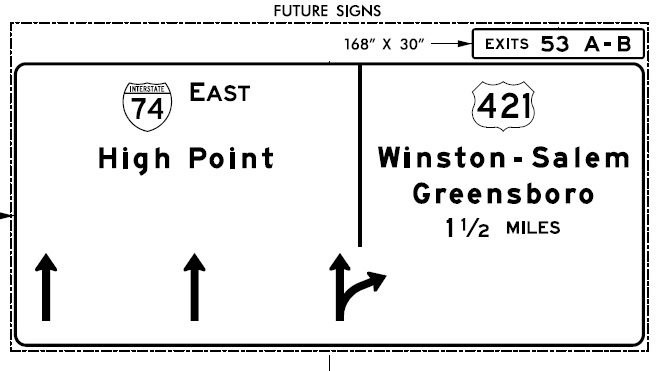 Though the signs for the Business 40 exit do not included NC 150, which is routed on the highway along with US 421, the ground signage still indicates its presence. Again, the long-term plan is for the Business 40 designation to be removed from US 421. The plans indicate that the exit numbers along this segment will be 53 A&B for Business 40, 50 for US 158, and they include the sign plan for the next segment to be constructed, from US 158 to US 311, which will be Exit 49. The remaining segments of the Beltway were unfunded, and their construction dates uncertain, until December 2014. 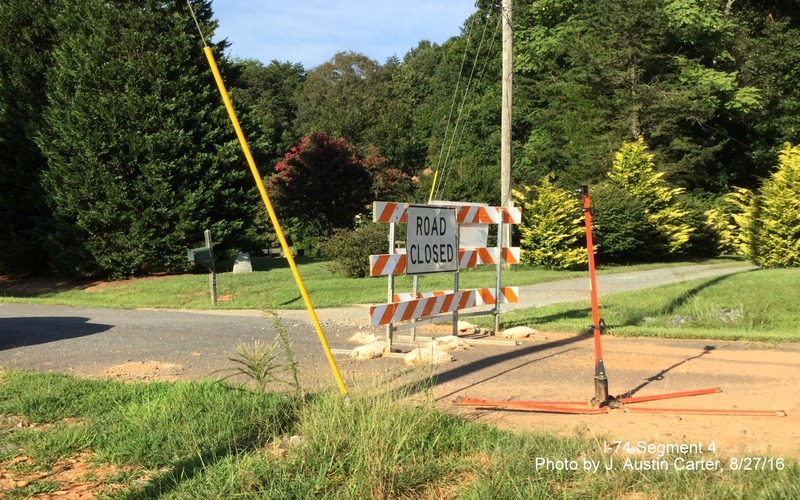 That month NCDOT released their latest draft State Transportation Improvement Program (STIP) document, formally approved in June 2015, which listed all funded projects in the state from 2016 to 2025. 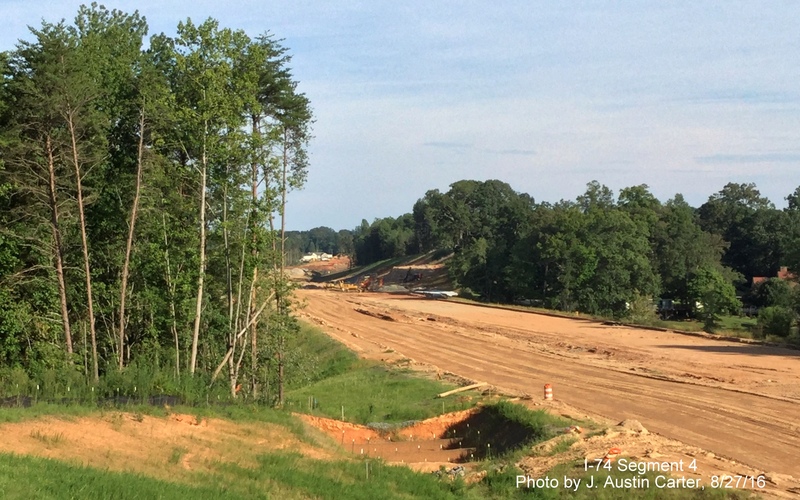 In the 2018-2027 STIP released in August 2017, among Forsyth County projects to be funded, included all of the remaining six Beltway segments. The next to be constructed (Segment C) will be the 1.4 mile US 158 to US 311/Walkertown Road segment which was awarded on December 6, 2017 at a cost of $68 million, work started in January 2018 with a planned completion by November 2021.7 The two segments (AA and AB) to connect these completed Beltway segments to I-74/US 311, from Business 40/US 421 to I-40 and from I-40 to I-74/US 311, will together cost $273 million and will start in 2018 and 2020. Contracts for the other 3 segments, unfunded in the previous TIP, D, US 311 to Baux Mountain Road, E, Baux Mountain Road to NC 8, and F, NC 8 to US 52, all Design-Build projects, were put out to bid in March 24, 2018, delayed 5 months in October 2017, now funded due to reforms to the 2015-17 state budget that added over $700 million in new moneys for transportation over the next two years.8 A contract which will build the Beltway interchange with US 52 was let in August 2018, work is to start by November with the project set to be completed in September 2022.9 If all the contracts are launched on time, construction could be completed by 2025. While waiting for NCDOT to wrap up its work, supporters of speeding up construction of the Beltway and upgrading US 52 north of Winston-Salem to interstate status formed the 'I-74 Piedmont Corridor Group' in 2003 and enlisted the support of former Governor Jim Hunt to help lobby legislators and NCDOT board members to build the highway.12 In March 2003, the Winston-Salem Journal wrote an editorial encouraging NCDOT to build the eastern half of the Beltway (I-74) first, arguing that there was less opposition to this part of the highway and the increased traffic on US 52 since the completion of the I-74 connector from I-77 to US 52 was leading to increased traffic congestion and accidents in downtown Winston-Salem.13 The FHWA signed off on the final environmental impact plans in December 2006. NCDOT then announced in March 2005 that construction on the western half would be postponed to 2015 at the earliest. 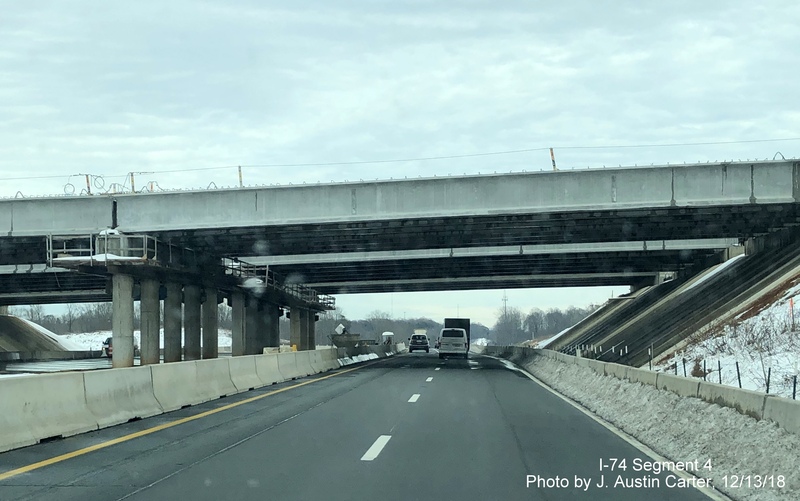 **14 Money saved from the postponement would be used to construct the eastern half, I-74, which was listed in the 2009-2015 STIP as Project No. U-2579, and scheduled to start construction by 2009. However, in 2008 another lawsuit was filed regarding the accuracy of the environmental study done for the western portion.15 Since NCDOT had combined the west and east portions in the document sent to the FHWA, the lawsuit stopped any activity on the Eastern segment as well, even right- of-way acquisition. While the new lawsuit was being settled, NCDOT moved forward on planning to build the eastern segment. According to the 2009-2015 STIP, about $224 million was to be used to acquire the right-of-way while about $450 million had been set aside for construction, a total of $702 million.16 This new total cost was substantially higher than that quoted in previous TlPs. 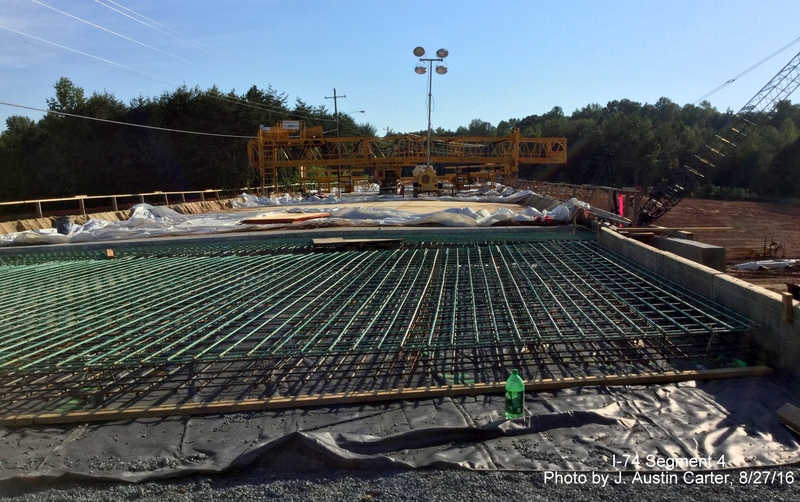 The increased costs were due to a few years since the last cost estimate, higher material costs, and the agreement by NCDOT to build more bridges along the route to help aide local traffic, plus expenses for environmental mitigation.17 Construction was to start first on the 3.4 mile portion of the highway from US 158 (Reidsville Road) to US 421 (Business 40), the 2009 cost estimate was $165 million. The 3.1 mile section between Business 40 and I-40 would start next with a cost of $160 million. Work would then start on the 1.4 mile section between US 158 and US 311 at a cost of $52 million.18 The remaining segments were unfunded but officials at the time were confident moneys would be found to complete them after the original three segments were complete.19 A final alternative to what was originally called the Eastern Half extension south of Bus. 40 to US 311 was chosen in March 2005. Construction was to start on this 4.4-mile segment after the other segments were completed.19 The chosen alignment puts the location of the interchange between the Beltway (I-74) and US 311 to the east of the current US 311/I-40 interchange and between the Ridgewood and Union Cross Road exits.20 The decision by Dell to locate a new company facility in Winston-Salem helped impact the choice of alternatives for the one chosen (N2-S1) kept the Union Cross Road interchange open to access the industrial park where the Dell plant was built. Ironically, Dell decided to close the plant in 2009, before a final decision on the Beltway was made. 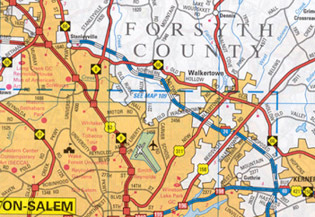 The NCDOT Winston-Salem Northern Beltway website has Maps of the chosen alternative, along with a Supplemental Final Environmental Impact Statement document released in January 2007.15 The last lawsuits were finally dismissed on May 20, 2010 by Federal District Court Judge Thomas Schroeder who said neither the Friends of Forsyth nor the NC Alliance for Transportation Reform could prove that the environmental studies performed for the FHWA were inadequate. 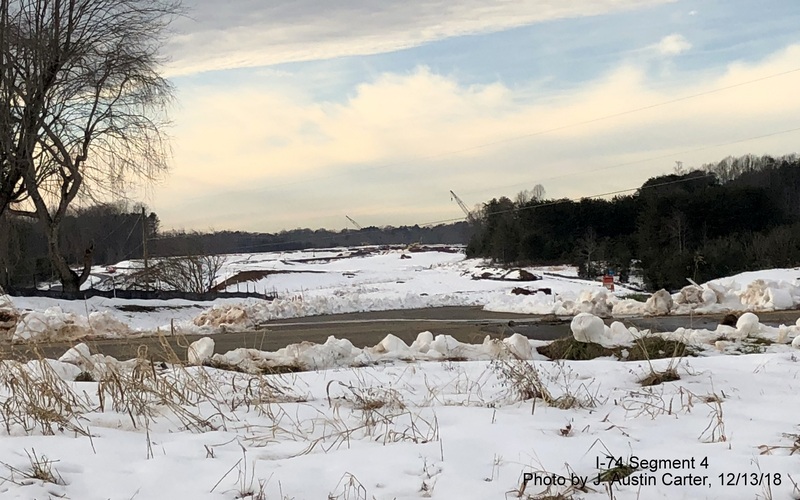 Before any of the work activity outlined above began in 2010, however, NCDOT committed to a reform process which included devising a new STIP process and a priority list for construction of the state's 21 beltway projects. Only the top eight projects on the list would go forward at the present time given limits in funding. When the list was produced in late July 2010 the Northern Beltway was listed last, 21st out of 21 projects. This meant not only that the project was not funded but that no work of any kind would happen until at least 2020, even work on obtaining the right-of-way, which affected citizens were promised would start in 2010.21 Citizens affected by the ruling vowed to fight it. They got NCDOT to change it's priority formula in 2011 allowing loop projects to be broken up and evaluated in segments. The good news was the Winston-Salem Beltway was moved up, the bad news was that it now ranked 13th, still not eligible for funding. The project again looked to be in limbo. 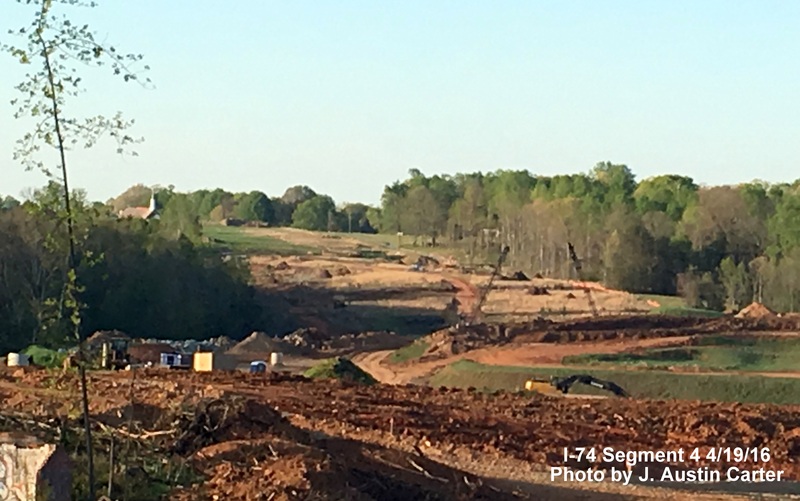 NCDOT meanwhile appeared to be 'hedging its bet' where the next Segment of I-74 would start by placing I-74 mileposts and I-74 exit numbers along the US 311 freeway east of Winston-Salem in late 2010 starting at its interchange with I-40, not where the Beltway is planned to tie in. This could be if either I-74 ends up being routed through downtown on US 52, or on an proposed extension on the US 311 freeway across I-40 and into Winston-Salem. a. The Eastern Section interchange with US 52 will be part of a contract building the first segment of the Western Section (I-274). For the latest official information on the Beltway, go to NCDOT's Winston-Salem Northern Beltway project page. 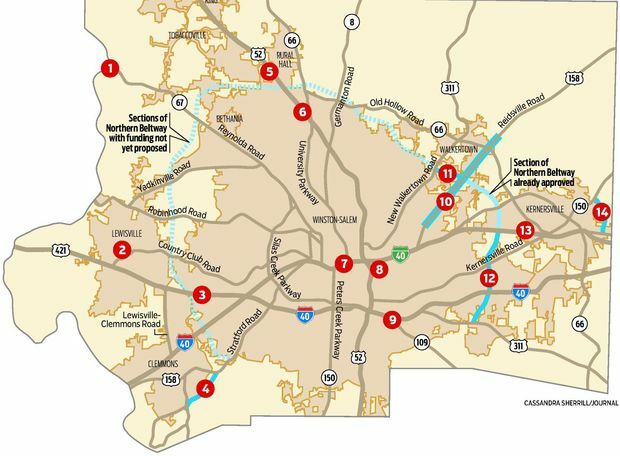 *In November 2004, NCDOT released, as part of its Strategic Highway Corridors initiative, a map of existing and proposed Triad area highways showing an I-285 extending from I-85 in Lexington to I-40 in Winston-Salem with a note saying it would be extended to I-74 if US 52 was upgraded to interstate standards.25 Currently, I-285 from I-85 to I-40 is not scheduled to be signed until after 2020, after all projects to upgrade the highway to interstate standards are complete, For more information, visit my Future I-285 page. If anyone else has photos of the current roads in the vicinity of this segment, feel free to E-mail me. Sources: NC Transportation Map 2001; ADC North Carolina Road Atlas 1999, p. 43, p. 129. (1) City of Winston-Salem. 2002. US 52 Corridor Study. Volume 1, January, p. 1. (4) NCDOT. 2019. "Watch for Upcoming Lane Closures on Business 40 in Winston-Salem." Press Release. April 17. Downloaded from: https://www.ncdot.gov/news/press-releases/Pages/2019/2019-04-17-business-40-lane-closures.aspx, April 18. (7) NCDOT. 2017. "Construction Starting on Additional Section of Northern Beltway." Press Release. December 6. Downloaded from: https://apps.ncdot.gov/newsreleases/details.aspx?r=14641, 12/6/17. (8) NCDOT. 2017. Final State Transportation Improvement Program, 2018 to 2027. August. Downloaded from:https://www.ncdot.gov/initiatives-policies/Transportation/stip/Pages/about.aspx, August 20, 2017. (10) NC Governor's Office. 2015. "Governor McCrory Announces Accelerated Timelines for Major Transportation Projects." Press Release. November 19. (11) NCDOT. 2004. 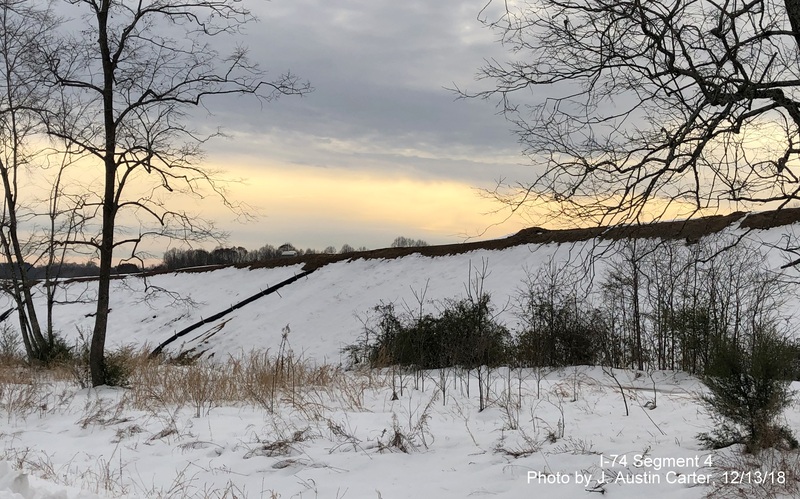 Winston-Salem Northern Beltway Supplemental Final EIS-Project R-2247, Supplemental Draft EIS- Projects U-2579 and U-2579-A. September. pp. 1-10-1-12. 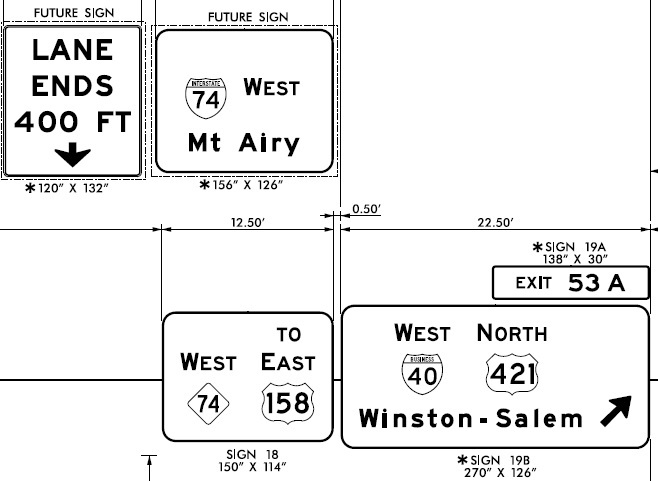 (Available at NCDOT's Winston Salem Northern Beltway page). (12) Biesecker, Michael. 2002. 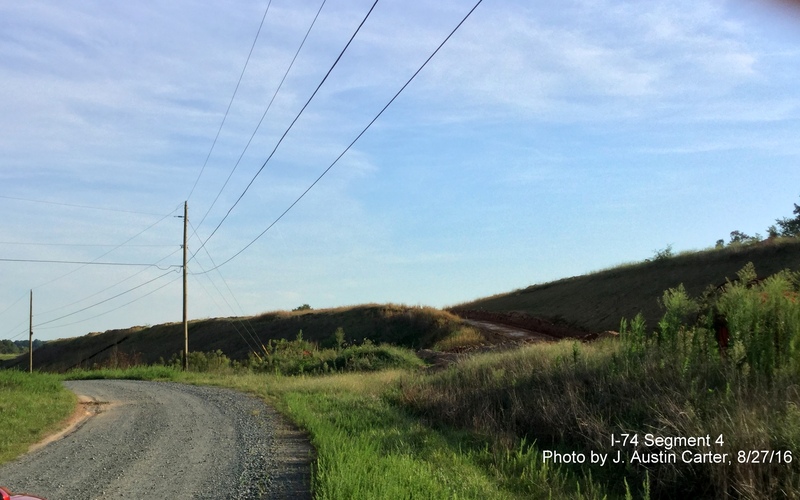 "Benefits of a Completed I-74 Outlined; Building Highway will Help Piedmont's Economy, Hunt Says." Winston-Salem Journal. October 23. (downloaded from www.wsjournal.com). (13) Young, Wesley. 2014. Map in "Roads Get Green Light." Winston-Salem Journal. December 5. (downloaded from www.wsjournal.com, 12/12/14). (14) Sparks, Jim and David Ingram. 2005. "Budget Woes Putting Damper on Highway Projects." Winston-Salem Journal. (downloaded from www.wsjournal.com, 3/21/05). (15) Young, Wesley. 2009. "Stuck in Limbo: Beltway Inaction Stymies Local Property Owners." Winston-Salem Journal. September 4. (downloaded from http://www2.journalnow.com/content/2009/sep/04/beltway-inaction- stymies-local-property-owners/news/ September 7). (16) NCDOT. June 2008. State Transportation Improvement Program, 2009-2015, Division 9, p. 9-20. (17) Sparks, Jim. 2006. "A Steep Rise In the Beltway: Higher Costs, Public Requests Fatten Price." Winston- Salem Journal. June 21. (downloaded from www.wsjournal.com). (18) Sparks, Jim. 2006. "Beltway Nearing its Final Hurdles." Winston-Salem Journal. December 26. (downloaded from www.journalnow.com, 1/12/07). (19) Sparks, Jim. 2006. "Eastern Leg Faces a Year's Delay." Winston-Salem Journal. September 8. (downloaded from www.journalnow.com, 9/8/06). (20) NCDOT. 2003. 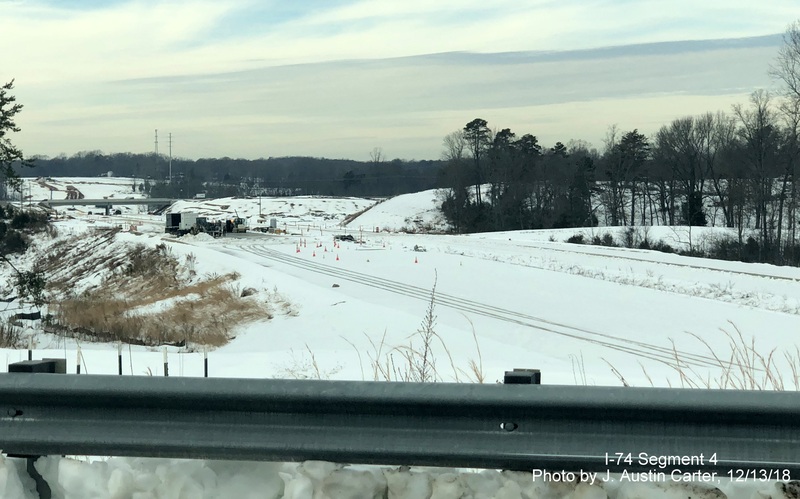 Winston-Salem Northern Beltway-Eastern Section Extension. Downloaded from http://www.ncdot.org/planning/pe/wsnbeltway.html, April 7, 2003. (21) NCDOT. 2004. Newsletter for Winston-Salem Northern Beltway. October. p.1, p. 3. (22) Young, Wesley. 2010. "Judge: Northern Beltway Can be Built Around Winston-Salem." Winston-Salem Journal. May 20. 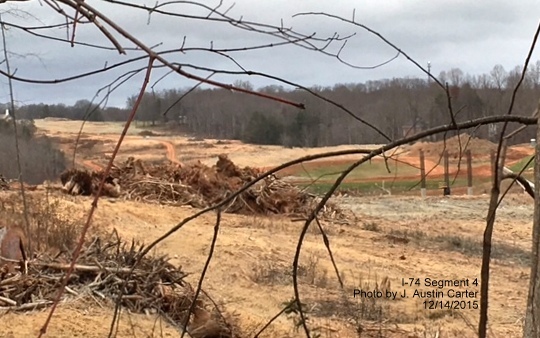 (downloaded from http://www2.journalnow.com/content/2010/may/20/201513/judge-northern-beltway-can-be-built-around-winston/news/ May 21, 2010. (23) Winston-Salem Journal. 2003. "Northern Beltway." Winston-Salem Journal. March 18. (downloaded from www.wsjournal.com). (24) NCDOT. 2011. Urban Loop Strategic Prioritization Process. Downloaded from http://www.ncdot.gov/performance/ reform/prioritization/, March 10, 2012. (25) NCDOT. 2012. Winston Salem Northern Beltway. NCDOT High Profile Projects and Studies. Downloaded from http://www.ncdot.gov/projects/wsnb/, March 10, 2012. (26) NCDOT. 2004. Strategic Highway Corridors. Vision Plan, Triad Area. Sept. 2, note 3. (27) NCDOT. 2018. 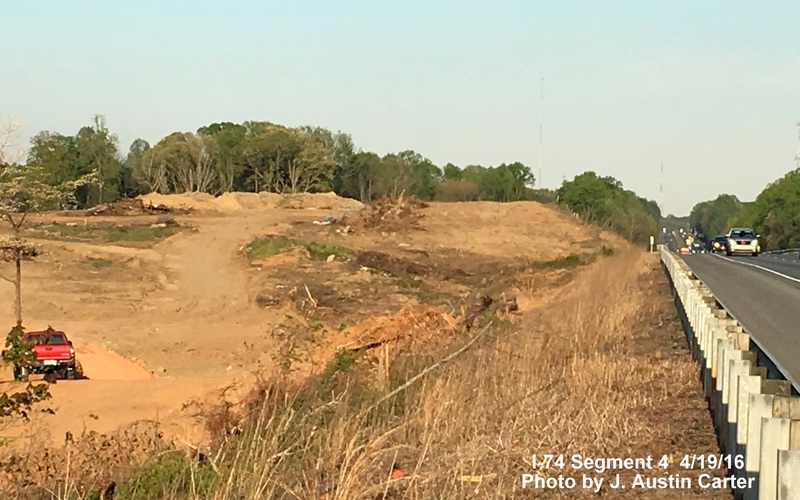 Final Request For Proposals, Design-Build Project TIP R-2247EB, Winston-Salem Northern Beltway Interchange with US 52 (Future I-74), p. 258. Downloaded from: https://connect.ncdot.gov/letting/Design%20Build%20Program/R-2247EB/R-2247EB%20Final%20RFP%20Corrected% 20with%20Disclaimer.pdf, Nov. 26, 2018. (28) NCDOT. 2008. 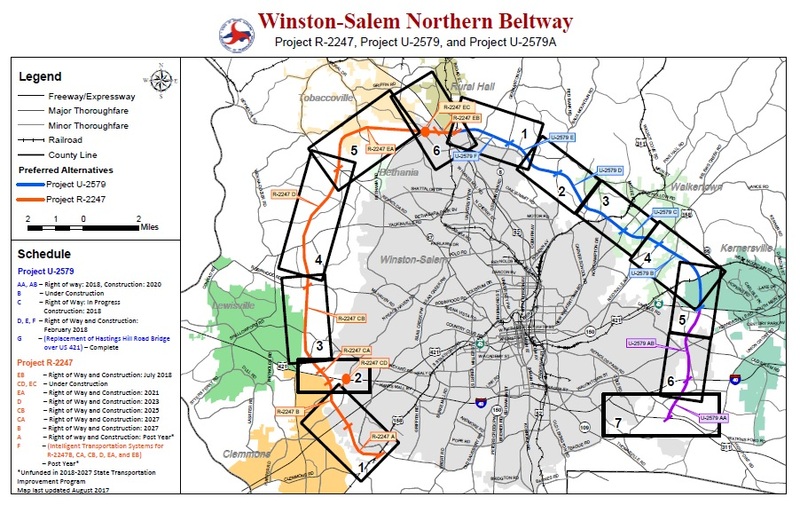 Winston-Salem Northern Beltway Eastern Section and Eastern Section Extension Final Map, Public Hearing Document. Handout. August 14. (29) NCDOT. 2012. Policy to Projects, Draft. September 5. Appendix 24: Division Nine STIP Project List, p. 288. (31) NCDOT. 2017. State Transportation Improvement Program, 2017 to 2027, Draft, Division 9, Page 9-8/31. I-274 and I-74 shields courtesy of David R. Kendrick's Shields Up!